Face it: the minute Capcom releases a new Monster Hunter game on the PS Vita, Sony will sell a bajillion PS Vita units. But now, Nintendo has locked up Monster Hunter 4, so tough crap? 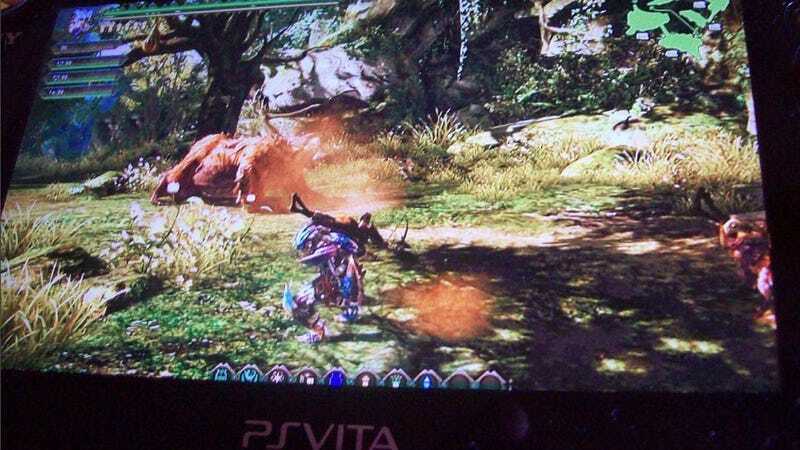 These mysterious screens hint at the possibility of a new Monster Hunter game in the Vita's future. Or do they? The images appeared on a Chinese bulletin board. And like most things that pop up on bulletin boards, let's use some caution! Online in Japan, people seem unsure if this is Monster Hunter for the PS Vita, a Vita version of China's Monster Hunter rip-off Hunter Blade, or simply a clever prank. Whatever it is, it sure looks nice on that Vita! UPDATE: We always said this was shaky, but we initially missed one important detail that should have put this even more in the "probable hoax" category. A third image, not initially shown in this post but viewable in the link below, includes a fraps.com watermark. Fraps is a video-capture program commonly used to record video of PC games. It looks like someone grabbed a scene of this game through Fraps and then put it on Vita. Sorry to get any Monster Hunter fans' hopes up.